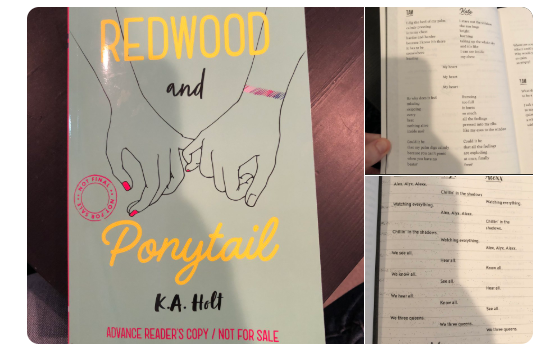 Carol thank you for highlighting Verse Novels and in particular the writing of K A Holt. I have previously purchased, read and enjoyed, 'Rhyme Schemer,' but now you have alerted me to more possibilities to add to my ever expanding collection of this genre. I shall do some delving on Twitter as well. These alerts have made my day! Thank you for hosting. Congrats on judging the Cybils this year. I had a lot of fun doing it in the past, especially as a first round judge. And I agree with the author of HOUSE ARREST and KNOCKOUT that we're ready for a poetry explosion!!! Wow, Carol...K.A.Holt sounds like she's unstoppable ~ Thanks for introducing me to her work. And yes, Happy Poetry Friday! The Poetry of US: More than 200 poems that celebrate the people, places, and passions of the United States. Hi Carol! So sorry to hear about your furnace. Ugh!! I have a couple of my poems and a cheerful mouse drawing. I suppose more people reading poetry is a silver lining to our crazy times.What a fascinating post about verse novels and K.A. 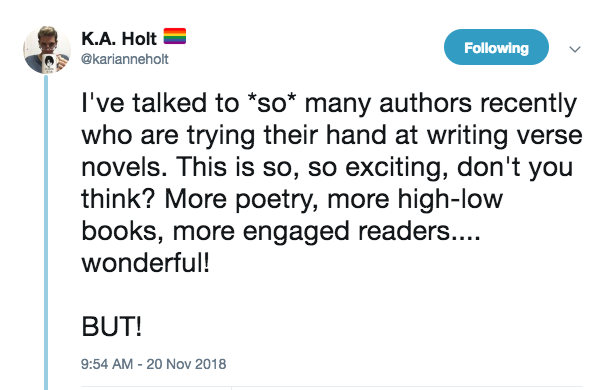 Holt's thoughts about them and poetry in general. Thanks so much for hosting this week! Also, I'm terribly sorry about your furnace. I live in an antique house with an aging furnace and live in fear of a dire diagnosis! Maybe increased fuel efficiency and lower bills will be your silver lining? Oops! Here's my link! I'm in with a triolet this week. Hi Carol, Thanks for hosting! I'm talking craft today with thoughts on creative cross-training over at A Word Edgewise. GAH! Sorry about the furnace! It's always something...or two or three or five! Thanks (to you AND to Karianne) for including the entire thread of tweets. Lots to think about! I'm definitely following her now! I've got an original haiku in response to the OSU/Michigan rivalry, and the January-June sign-up for Roundup Hosts. Morning, Carol! I will be back to read your post this evening, but thank you for posting, and I hope you are warm! Thank you for hosting! Today at The Poem Farm, I have a letter poem in response to a painting by Jan Irene Miller...a part of SPARK 39! So sorry to hear about the furnace, Carol - we went through that just a few years ago. And then found out last year that the actual TANK needed to replaced, as well! Hang in there. Glad we are CYBILS judges this year, so I'm eager to hear what others think of this and some of the other many books we've read through. I've spent some time without heat here in New Hampshire, so I feel your pain! I hope to catch up on some of the novels in verse you've listed--I've missed so many! Hi Carol, I'm rushing out to morning yoga and will be back to read your post later--today I'm sharing "First Snow," my winter poetry swap gift from Irene Latham. Wonderful post, Carol. I haven't read any of Holt's books and now I must. What gems of wisdom she shared in her tweets!! Sorry to hear about your furnace. As Linda said, there's always something with a house, unexpected repairs and expenses. 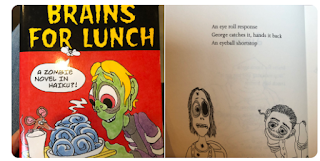 This week I'm featuring Jorge Argueta's first poetry picture book, A Movie in My Pillow/Una pelicula en mi almohada, with information about the Library of Dreams he founded in El Salvador. Thanks so much for hosting this week. Keep warm! Thanks Carol. It is pretty cool how there are more novels in verse being written - which reminds me there's a few on my TBR list that I've been wanting to get to. & it might be an interesting thing to attempt to write if I ever decide to get ambitious. This week I've just written a little poem in response to recently moving house. Keep warm! Sorry to hear about your loss of heat. Been there--last winter! I just received a copy of Knockout. Hope to read it this weekend. At Wild Rose Reader, I've selected a poem by Edna St. Vincent Millay titled "When the Year Grows Old." I hope you find a reliable source of heat! I love your blog! I was a slicer until this past fall and have not sliced for a couple of months now, for a variety of reasons. However, I am writing daily on my blog - The Apples in My Orchard. I do see some familiar names/blogs on the comment section. This is just the second or third Poetry Friday to which I've submitted. I"m so glad I found the link today for the round up - sometimes it seems difficult! I'm somewhat confused as whether I should be submitting poem I wrote or a link to a book with poems I enjoy. Sending you warm thoughts, Carol--hope your house is cozy soon! I went to a novel-in-verse webinar last month that featured KA Holt--not sure I'll ever attempt one, but the webinar was fascinating. Those tweets look like the cliff notes of the webinar! At Deowriter, I have a haiku and photo. Also a remember to sign up for New Year Postcards (totally different from student poetry postcards). Okay, I'm not RIGHT back but I am back to thank you for this fulsome, insighful post and for rounding up today. I hope you have gotten your heat worked out - brrrrr.! WARMest wishes your way. Thanks for hosting today--and thanks for sharing from K.A. Holt. I haven't read any of her books--but I want to! I think it's amazing that anyone can write a whole novel in poetry. And that more people are doing it now is awesome! Thank you for posting about verse novels and what to remember the writing is still poetry. 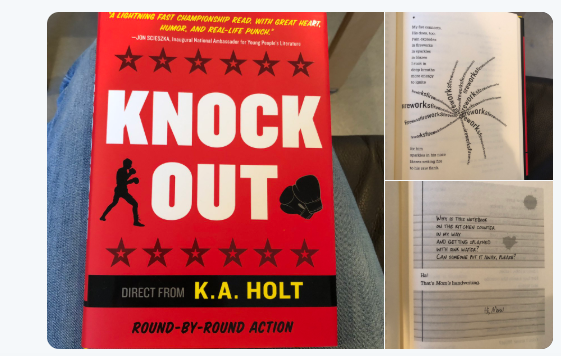 I will definitely find the work of K. A. Holt. I need to read more of this genre. Thanks again. I read House Arrest with you a couple of years ago, and I saw Karianne speak at two different sessions at NCTE. She's one of those geniuses who seems really regular and normal and not intimidating at all. she's incredibly insightful and knows how to get all kinds of points across with subtlety and humor. I'm back, I think, and better late than not at all! Carol, I feel your pain! On Tuesday our new (and pricey for us) heating and air unit is being installed. There's just never a good time for these things. I've been away at a conference this weekend and am circling back to Poetry Friday now that I am home and settling back into regular life. I so enjoyed what you captured from K.A. Holt's twitter feed. Thank you! At my conference I shared verse books that can do the heavy lifting of history. I've already decided that will be the theme of my post next Poetry Friday. I hope you are warm and cozy soon.